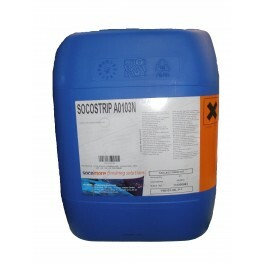 Socostrip A0103N is a new generation aviation paint stripper activated by hydrogen peroxide. Free from phenols, chlorine, hexavalent chrome. Remove all paints. Particularly adapted for epoxy, polyurethane and alkydurethane paints. Not corrosive and does not embrittle any aeronautical metal except magnesium alloy. Certified by: Airbus, Boeing, Dassault, Cessna, ATR, Eurocopter, Embraer, Hawker Beechcraft.